Gaumont To Turn Julian Lennon's 'Touch The Earth' Into Animated TV Series . Beatles Radio: The Beatles, Solos, Covers, Birthdays, News The Fab 4 and More! 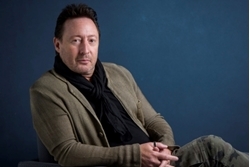 Gaumont has made a deal to turn Julian Lennon’s book trilogy Touch The Earth into an animated TV series. The second volume, Heal The Earth, gets published this month by Sky Pony Press. Lennon and his children’s book collaborator Bart Davis will be executive producers and will work on the project with Gaumont President of Animation Nicolas Atlan, and Terry Kalagian, Senior Vice President, Creative Development for Animation & Family. Kimberly Dennison will be the presiding exec. “It is an exciting time as we engage in the process of connecting the right creatives to the project who will share the passion for the show’s messages and themes,” Lennon said in a statement. “I am truly enthusiastic about working with Gaumont and appreciate the sensitive energy and insight given the entire Touch the Earth series.” Co-author Davis said the goal is to empower more kids.